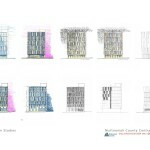 The site for the new courthouse was selected last year, after a long list of sites was narrowed to two potential sites. 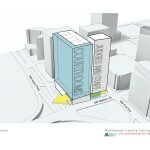 The site that was chosen is on County owned land at the Hawthorne Bridgehead, surrounded by SW Madison St, Naito Parkway, Jefferson St and First Ave. Roughly one quarter of the block is occupied by the Jefferson Station office building, which is listed on the National Register of Historic Places and will remain. 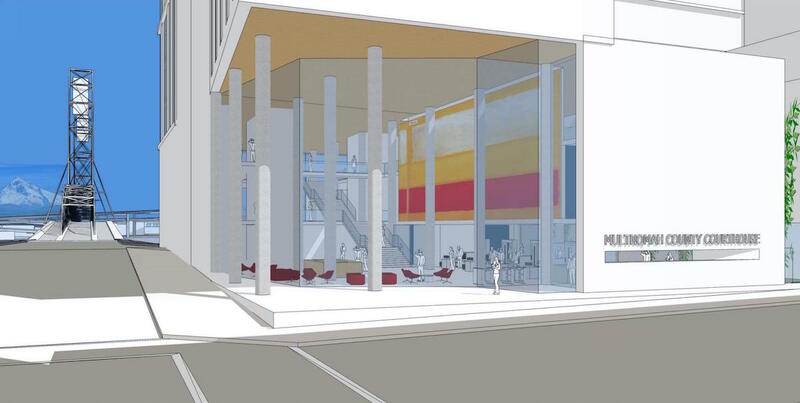 In January 2016 it was reported that Multnomah County will buy the Veritable Quandary restaurant annex and incorporate the land it sits on into the site. The restaurant will close in the autumn. 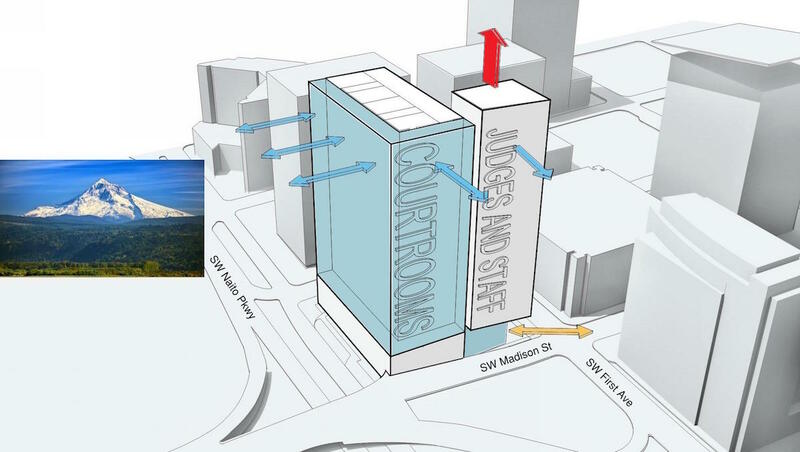 The courthouse will be arranged in plan as an “L” shape, split into two distinct volumes: a bar for the courtrooms on the east half of the block; and a smaller tower form for the judges and staff offices at the northwest corner of the block. 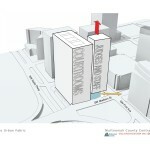 The public circulation will be located at the perimeter of the courtroom volume, allowing for uninterrupted views to Waterfront Park, the Willamette River and Mt Hood. The main entry to the building will be located at the corner of SW Madison and First Ave. 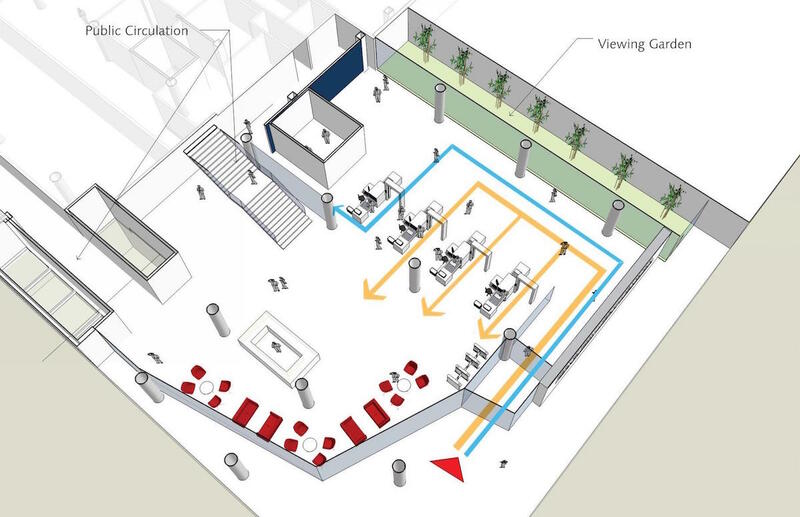 The entry sequence will be arranged so that the public lobby can be seen directly from the entrance, without being obscured by the security screening area. Unlike the current courthouse there will be sufficient interior space to ensure that security queues won’t have to form outside. The triple height lobby will include a grand staircase aligned with the east-west axis of the building. 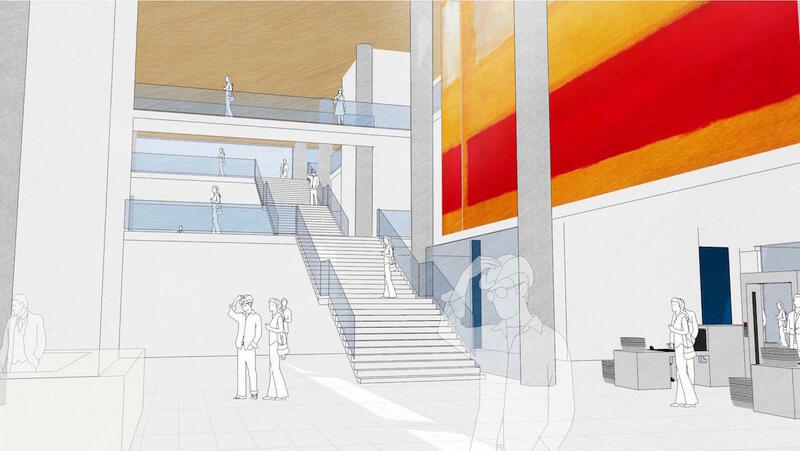 The staircase will terminate at the jury assembly area on the third floor, where the building will have views to the river uninterrupted by the tree line. 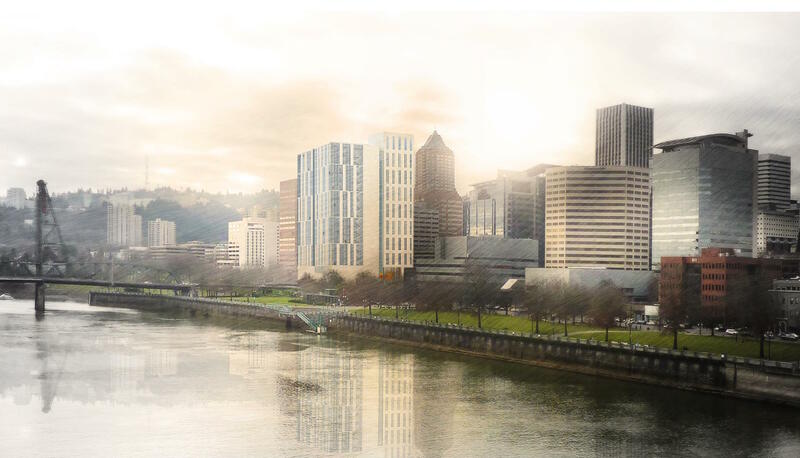 A triangular portion of land to the north of the building, formed by the Hawthorne Bridge ramps and owned by the County, could potentially be re-landscaped as part of the project. 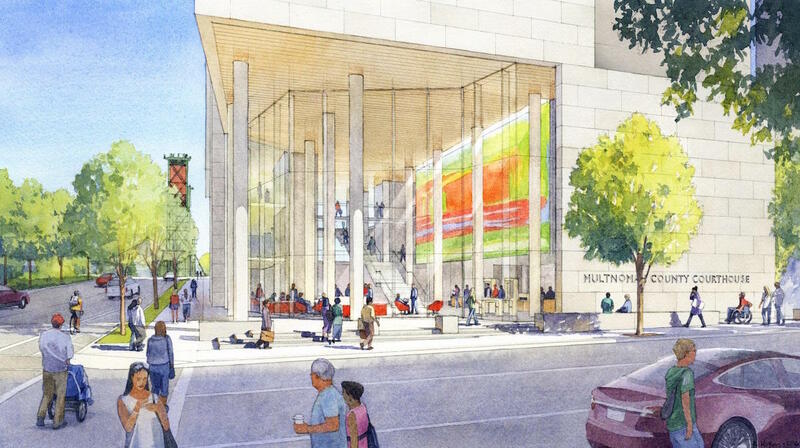 The landscape architects are exploring the idea of bringing the material and planting palette used around the new court building across Madison to form a new plaza. 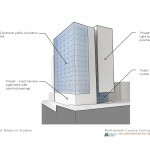 The new courthouse will exceed the 200′ height limit that currently exist on the site. In March 2015 the City Council voted 4-1 to approve the West Quadrant Plan, which established the principle that heights on this block, and others at the Hawthorne and Morrison Bridgeheads, be raised to 325′. These height increases have yet to go into effect, and are dependent on the adoption of the Central City 2035 plan later this year. 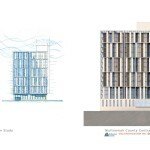 To keep on schedule the County plans to apply for a Zoning Map Amendment to increase the allowable height on the site earlier. This legislative process will need to be approved by the City Council, after hearings at the Planning & Sustainability Commission. 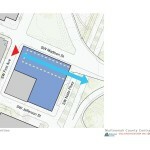 A similar process last year resulted in the approval of a height increase for the County Health Department. Assuming the height increase is approved, the County will be able to proceed to Design Review. 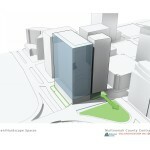 The project will be required to go through a Type III Design Review, with public hearings before the Design Commission. The architects expect to have an initial Design Advice Request hearing this Spring. 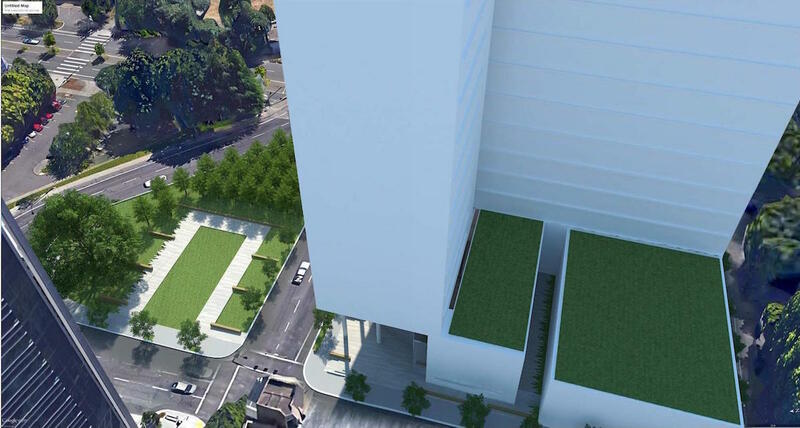 Construction is expected to begin in 2017. 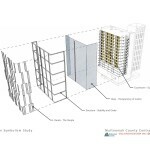 This entry was posted in Downtown, Multnomah County Courthouse, PLACE, RicciGreene, SRG Partnership. Bookmark the permalink. 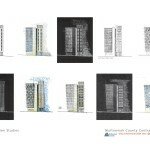 That enlarged east elevation study looks like an homage to all the 5 over 1 apartments around town. Different ground floor, five stacked floors above with an offset window pattern. Is that our current Zeitgeist? I love seeing all the other exploration though! Keep it up! I do hope they will work on the blocky massing given it’s prominent location. We really need to see something interesting at this key site. 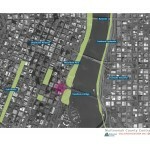 What would be interesting is to have a “bridge” building that straddles both Madison St and the bridge off ramp. (OHSU has a few “bridge” buildings that are successful at creating a gateway effect). This would be a better use of the leftover island between the ramps that appears to be a proposed garden (it won’t get used). 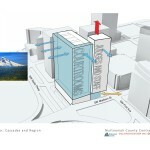 This would prevent the need to tear down the Veritable Quandary building that will surely be missed. We seeing too much of the same formula on a budget. We need to demand more! “Bridge” building not possible for a courthouse due to security concerns (this bldg. is a prominent symbol of the judicial system after all). Can’t have a drive through or drive under design that exposes the structure and occupants to a massive security risk. Now a sleek pedestrian bridge connecting the courthouse to a new civic plaza is worth exploring. Are you citing an official prohibition on “bridge” buildings or is that an assumption? If it is official, it is a false sense of security as the Oklahoma City bombing too clearly demonstrates–one need not be under a building to bring it down or compromise its structure. It would be unfortunate to allow the design of such a public and symbolic building be guided by the forces of fear instead of higher civic motivations. Nonetheless I agree a pedestrian bridge certainly would elevate the current proposal. Not based on anything official that I am aware of. My comment reflects what I see as the reality of judicial architecture in a post-911 world where the risk of terrorism is a factor in the design. GSA developed new security guidelines for federal buildings based on the Oklahoma City incident, with “standoff distances” being among the new measures. I am making an assumption that local and state agencies would get guidance from federal security standards in the design of new judicial buildings – at least I certainly hope so. A “bridge” design would represent a security risk, in my opinion. I do agree with you that the particular location of this building demands a signature statement in the design and that it is a gateway in many respects. Absolutely depressing. Aside from the purely functional aspects which are promising given the clear diagram, this is far less inspiring than the inevitable rubble left from the current building when it collapses in the earthquake. So why exactly will it collapse in an earthquake? Sad to put a courthouse on the riverfront! Even the best architecture will be able to overcome the fact that this is a courthouse- not a place anyone will ever WANT to go. THis location desrves something far better.